Usually cakes, cookies and brownies are things you'll have to avoid on a gluten-free diet. You wouldn't think gelatin desserts are something you'll have to skip too. Although sugar-free Jello-O doesn't have any obvious gluten-rich ingredients, like wheat, it's still not considered gluten-free. 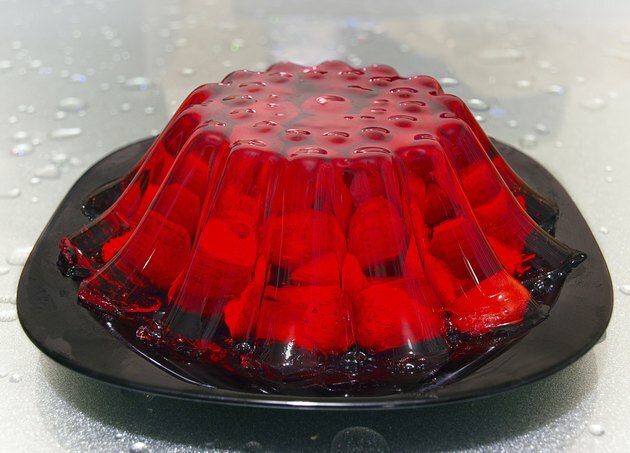 While it may not bother you at all, the trace amounts of possible gluten in Jell-O could upset your belly. Sugar-free Jell-O is made up primarily of gelatin. The manufacturer adds in food coloring for visual appeal, as well as several flavoring agents. Regular Jell-O has sugar as a sweetener, which gets swapped out with an artificial sweetener -- usually aspartame -- in the sugar-free varieties. None of these ingredients directly contains gluten. But Jell-O's manufacturer, Kraft, doesn't certify that Jell-O products are gluten-free. The company claims that some of its coloring and flavoring ingredients come from suppliers that don't always label every possible gluten contaminant. So while the final Jell-O product is probably gluten-free, it isn't guaranteed. Facilities that process these coloring and flavoring ingredients manufacture many types of products. It's likely that at some time during production, the plant processes something that has wheat, rye, barley or other gluten-filled grain. Traces of gluten can be left behind on equipment, can go airborne when a wind picks up or can get transferred to another location when a worker touches several products. These scenarios cause cross-contamination, where foods that would normally be gluten-free, including Jell-O's coloring and flavoring ingredients, become contaminated with gluten. Because sugar-free Jell-O doesn't have any clear grain ingredients, it might have no effect in your gut. If you're very sensitive to gluten, however, avoid all Jell-O products, including the sugar-free varieties. Otherwise, if you eat the gelatin dessert, you could have painful cramps, gas and bloating in your abdomen associated with gluten intolerance. You might even experience diarrhea just by ingesting the minimal amount of gluten. Be alert when you're food shopping. Reading through the ingredient list and looking for grains is your first priority. Sometimes those lists are long, though, so manufacturers have the option of putting special terms on their packaging. As long as the final product has less than 20 parts per million of gluten, food producers can put "gluten-free," "free of gluten," "no gluten" or "without gluten" on the label, states the U.S. Food and Drug Administration. These phrases are your signs that the food is safe for you to eat.